Lubel, Brian, Bob, and myself headed to Atlanta, GA for the second stop of the NMCA series. 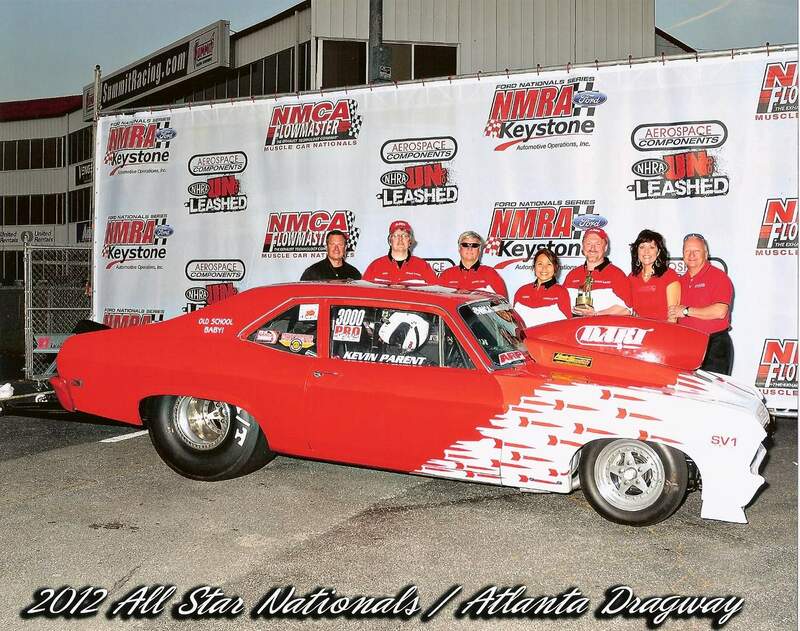 We arrived in Atlanta early Friday morning as we had our first qualifier that day. We were able to make one test hit as that that was the first time the car had been out this season. The car went straight and we were ready for the call for the first qualifier. They made the call and all the NPS competitors headed up to the lanes. After it was all over, our team managed a #1 spot with a 7.28. We packed up feeling good about our efforts. We arrived at the track Saturday morning to find out we had 3 more qualifiers that day for a total of 4. Team Baskin in their new body style Camaro managed to send us to the #2 qualifying spot as they were able to run a 7.26. With 2 more shots at regaining the #1 spot we went to work to better our time. Our 3rd qualifier did not improve our time so we had one chance left to make it happen. The call was made for our final round of qualifying so we headed up and got ready to make the pass. With a couple changes made prior to heading up, I felt we would improve but didn't know if it would be enough. I made the pass and as I was slowing the car down I heard Brian on the radio say we did it. We pulled a #1 qualifier the last pass. This was good news as there were a odd number of cars and that gave us the bye first round. 3000 NPS 69 NOVA DART 520 KEVIN PARENT ROCHSTER HILLS MI 7.269 194.04 194.04 4 NPS 11 CAMARO CHEV 638 SKIP BASKIN COVINGTON TN 7.269 190.35 190.35 3807 NPS GTO PONT 530 DARREN BREAUD HOHENWALD TN 7.286 188.60 188.60 2 NPS 69 CAMARO CHEV 638 JEFF COLLETTA WALKER LA 7.307 188.96 190.38 3003 NPS 78 CAMARO CHEV 634 DAVID BEESON BATON ROUGE LA 7.333 187.26 187.26 3074 NPS 74 TRANS AM PONT 525 KEITH MCCOY WASHINGTON IL 7.402 188.70 188.70 3 NPS 04 MUSTANG FORD 398 JOE BUCARO CORAL STREAL IL 7.457 159.08 182.82 We packed up and got some rest as we knew we would have to be on our game as the field was tight with 7 cars all running very close ET's. We ran our first round of eliminations and lifed early as we had a bye run. Second round brought us against the #3 qualifer Darren Breaud. We we able to get by that round and that put us in the finals against #4 qualifier, Jeff Colletta. The call was made for all final round contestants to head to the staging lanes. We had lane choice and chose the right lane. Jeff and I staged and waited for the tree to come down. Jeff left first so I had some work to do or so I thought. Just bfore the 60' clocks Jeff's car disapperared out of sight and left us truckin down the track with with no one beside us. I kept in it till the finish and saw the win light. I got confirmation from my crew thru the head set that we we had one. It was a great weekend. we have a couple issues to look at before the next race at MIR June 8th-10th, but we look forward to meeting up against some of the toughtest races in this class.